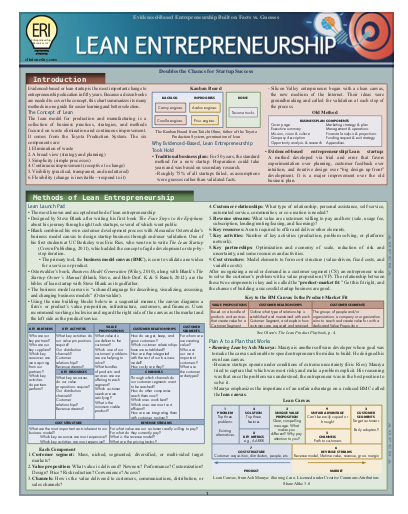 After a couple of years in the making, the badly needed Lean Entrepreneurship Guide has been published. It will be introduced at the upcoming entrepreneurship organization conference, the USASBE, in St. Petersburg, FL January 23-26. A six-page, laminated chart, the guide summarizes all 15 methods of evidenced-based, lean startup planning. It features the Steve Blank Lean Launch Pad method, but also has two engineering school methods, a complete glossary, a detailed lean course outline, and an explanation of the customer development process. The evidenced-based, idea validation way of planning is the most important change to entrepreneurship education in fifty years. It comes out of Silicon Valley where their new internet platform required a different way to do startup than a traditional business plan. It has evolved over a decade with various refinements and adaptions. Absorption of some ten books is now required to grasp the meaning of lean startup. This guide is the first real summary of all methods and the strategies. Students, aspiring entrepreneurs, and government entities can use the guide to train the one method that guarantees success or failure before scaling or risking large sums of capital. It’s purpose is to answer two questions. Not “can this product be built”, but “should this product be built” and “can we build a sustainable business around this product or service”? To answer these questions the user engages in a customer development process using a one-page diagram called the business model canvas (BMC). Its nine component sections force a thorough analysis of the idea by diving deep into the mind and persona of the end-user or target buyer. The nine BMC sections are value proposition, customer segments, channels, customer relationships, revenue streams, key activities, key resources, key partnerships, and cost structure. A key to the process is the relationship between the first two components, the value proposition and its customer segments. Get this “product-market fit” right, and the remainder canvas sections become easier to complete. Entrepreneurs know before spending precious capital and before making the decision to scale or hire employees whether their idea for concept is a “go” or a “no go”. You can imagine how meaningful this insight can be. Under the obsolete traditional business plan, a planner might spend a year and a half doing secondary research, arriving at assumptions based on guesses. Under lean the same planner reaches facts based on customer inputs and establishes a market demand ahead of time. Why is this change so important? Never has there been a greater need to empower adult workers. Our entire employment structure is undergoing a fundamental change. Anything that can be repeated is being automated. For example, most cars today are manufactured by robots. At the same time the Gig Economy has transformed employees from salaried to independent contractors. Intuit predicts that by 2020 40% of American workers will be independent contractors. And, the ability of computers to learn and think using large-scale data (called “deep learning”) has taken artificial intelligence to new levels. As the “machines” learn to think they are actually replacing white-collar as well as blue-collar workers. What is so great about lean entrepreneurship is workforce centers, economic development bodies in addition to academic institutions can now successfully teach entrepreneurship. Studies confirm it can be taught and learn and now effectively thanks to evidenced-based and customer validation planning. This new guide contains all the ways of doing its process. In addition to detailed actions, it contains every known resource, the history of “lean”, various options for analytical canvases, ways to increase opportunity recognition, the principles of effectuation (decision-making factors expert entrepreneurs used), and other important model discovery books. Most significantly, there is a detailed Understanding Lean Startup course that can be adapted for personal use. The Lean Entrepreneurship Guide can help displaced employees start a business in a field they embrace, it can advance technology, improve existing procedures and products, and solve many problems. Moreover it can help society by raising standards of living, bring solutions to environmental concerns, and grow third world economies to stem unemployment. In short this publication is a game changer! Three Stories Every Entrepreneur Should Know.